A family saga unlike anything you've seen. 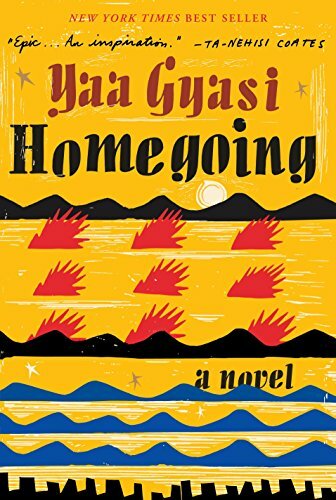 The opening pages of Homegoing—Ghanaian American Yaa Gyasi's debut novel—start a fire in Ghana that burns, one way or another, for more than two hundred years. Effia Otcher is born the same night this sudden conflagration destroys seven of her father's yams and burns all the way from Fanteland into Asanteland, where a half-sister whom Effia will never know is soon to be born. As a young woman, Effia is married to a British officer stationed at the nearby Cape Coast Castle and leaves her village for a new, luxurious world. She and the other officers' wives all know that something terrible is happening to people in the dungeons beneath their feet, but do their best to neither speak nor think of it. One of those people beneath the floorboards is Effia's unknown half-sister, Esi, captured in war and sold to the British, awaiting a hellish Atlantic crossing and a life of slavery in the American colonies. The story follows both lines of this divided family—from Effia through the escalating slave trade, warfare, British colonialism, and independence in Ghana, and from Esi through the the Civil War, the Great Migration, the Harlem Renaissance, and the heroin epidemic in America. To call the scope of this book "ambitious" would be an understatement: hundreds of years, thousands of miles, 14 major characters. It's the sort of thing against which new authors are often cautioned, and yet there are some vital literary purposes that require it, some stories that cannot be told otherwise. For all the history that passes, only five people stand between Esi's kidnapping and Marcus Clifton getting his PhD at Stanford. Five opportunities for the wrong done to Esi and the complicity of Effia's family to evolve, disguise itself, find new ways to do harm. We see parent after parent forcibly separated from their children, and then watch Sonny father and abandon babies through the Sixties—evil transmuted, inexplicable except by familiarity with its earlier forms. On Effia's side there is a similar brokenness as people run from their families and raise their own children alone, rootless, in an echo of the chaos across the ocean that Effia's brother and son helped cause. None of them are able to escape it, and we must see it all to understand. The story Gyasi is telling is just that big. It is not executed perfectly. When I saw the family tree at the front of the book, I was surprised at the relative slimness of the volume in my hands—only 300 pages for all these people. The brevity of our time with each of them does put a bit of a strain on the narrative, creating moments when characters seem more point than person. Events, too, sometimes take on an air of contrivance when everything is so compressed. Abena makes a visit to Kumasi to see the Golden Stool and happens to catch sight of a Christian missionary. Though the man is only mentioned in passing, the effect of the moment left me totally unsurprised when Abena fled to him a few pages (and several years) later as her world fell apart. I wanted not to expect it, but there wasn't enough else happening in her narrative to disguise it. Willie Clifton's chapter is contained in a walk she takes out of Harlem and into a whiter part of New York, where she runs into the ex-husband she has not seen in years. Characters' internal musings conveniently and immediately bring up their backstories. None of these moments are problems in and of themselves, but the quick progression of the narrative doesn't quite support them. When I first looked at the family tree on which the story hinges I knew that the two people at the very bottom, Marcus and Marjorie, would meet and end the story together as the culmination of everything that came before them. I noted the improbability of this ever actually occurring in reality, but unlike the smaller contrivances I've already mentioned, I felt in this central instance more like I had signed a contract when I opened the book, agreed that for the story that needed to be told, something like this would have to happen. Every piece of fiction, after all, is a study in contrivance; it's just more fashionable at the moment for books to pretend otherwise. And as I write this, I wonder if perhaps my own way of seeing prevents me from imbibing some of the beauty not in the story—the story itself is so very, very beautiful—but in the writing of it. On a structural level, at least, I think this might be true. Chigoze Obioma, author of The Fishermen, said once that when people ask him whether the presence of a prophetic madman in his novel is an instance of magical realism, he responds that to a Nigerian such things are simply realism, the world as it is. When Marjorie Agyekum stands on the Ghanaian coast with her grandmother Akua and hears the history of her family, I find myself incredulous. It serves the narrative, certainly, but Effia's side of the family has lived as disjointed a history as Esi's. None of them know the story of where they came from and who their ancestors are, but here Akua knows all the names, all the events of hundreds of years ago, and presents them to her granddaughter as an unbroken chain of story, just as we have experienced them in reading. Akua has always been a woman visited by visions, so it is inferred that through these she has learned all she knows, but I was frustrated that so suddenly and easily Marjorie could be gifted her whole story, that such a contrivance would be invented for just this one purpose. It seemed like an odd escape from the fragmented history that has plagued the whole family all these many years. But perhaps what seems to my eyes to be naked narrative utility is, to someone able to see differently, just the world as it is—a world where ancestors speak, a world I might not have glimpsed had I not read this book. Catherine Hervey is a writer in Glen Ellyn, Illinois.